The British Columbia Real Estate Association (BCREA) reports a 27% decline in residential unit sales from the same month last year (as per MLS®) which is a total of 4,533 residential unit sales recorded. The average MLS® residential price in the province was $678,625, a 9.3% decline from February 2018. Total sales dollar volume was $3.08 Billion, a 33.8% decline from the same month last year. Total MLS® residential active listings increased 36.5% to 30,891 units compared to the same month last year. The ratio of sales to active residential listings declined from 27.4% to 14.7% over the same period. “Falling mortgage rates should provide some relief for homebuyers, providing a small boost to affordability heading into the spring,” added Ogmundson. As per the Real Estate Board of Vancouver, the February statistics for Metro Vancouver can be seen below. The Metro Vancouver* housing market saw increased supply and below average demand in February. The REBGV reports that home sales in the region saw a 32.8% from the same month last year (1,484 units in February 2019). Last month's sales were 42.5% below the 10-year February sales average. While it has been an ongoing trend that demand has been outpacing supply, residential sales have not been slowing down. In the latest market stats released mid-June by the British Columbia Real Estate Association (BCREA), there continues to be a month-over-month surge in residential sales. There has been a 26% increase in sales from April 2017 to May 2017 with a total of 12,402 residential home transactions. If it weren't for the low supply, 20-year low as a matter of fact, sales figures may even be higher than actual figures. This amount is 8% lower than May 2016 when the market was hot. 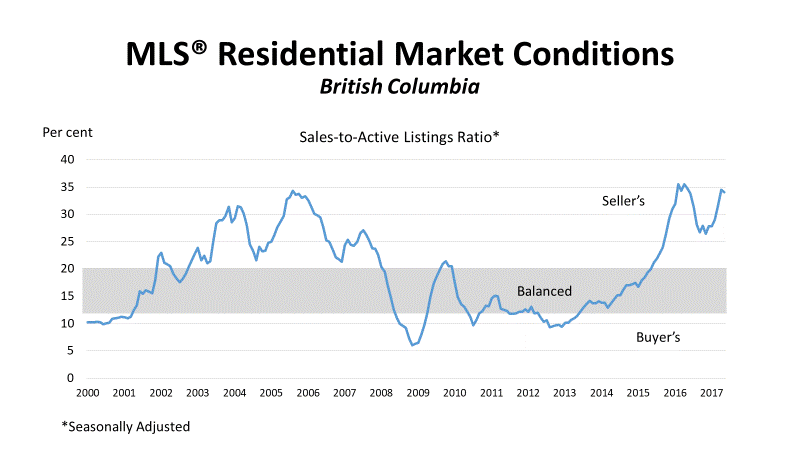 As you can see below, as a result of 9 of 11 real estate boards in BC having a home sales to active listings ratio above 20%, this has resulted in a seller's market. The BCREA states that anything greater than 20% for a sustained period is a seller's market. The Greater Vancouver region, the Fraser Valley, Chilliwack and Victoria all have seen ratios of over 50%. In May 2017, MLS® recorded a total of 12,402 residential unit sales and an average MLS® residential price in BC of $752,536 which is a 7.9% decrease and 4.2% increase, respectively, from the same period last year. Total sales dollar volume amounted to $9.33 Billion which is a 4% decrease from May 2016. For a detailed look at residential statistics for May 2017, read our previous blog here. For all your real estate needs, contact Amalia Liapis at 604-618-7000 or alternatively at amalia@wesellvancouver.ca.